The Lone Star Queenstown Open is Queenstown Tennis Club's major event of the year. Open to anyone regardless of age, ability, residence or club association, the tournament will stage events in men's and ladies' singles, and men's doubles and ladies' doubles. There will be consolation events for those knocked out in early rounds, so participation is encouraged. Further tournament information can be found HERE and links to entry forms can be found below. From 10:15am: Singles for those that want to play. First 16 players to register with Karen on 0276604411 by 5pm Friday are in. Karen will text out the matches and start times Friday evening. From1pm: Mixed social doubles in the "Fast Four" format. You may wear a Xmas costume if you wish but it is not obligatory.The clubhouse will be out of bounds as we'll be setting up for dinner. From 6pm: Welcome drinks for attendees of the Xmas party & dinner. Followed by sit-down Xmas buffet and dessert, followed by Secret Santa, followed by some dancing perhaps. ​Cost of the Xmas dinner is $30 per adult. Partners and non-members are welcome to attend. Kids eat for free. If you wish to be included in the Secret Santa, please bring a wrapped gift to the value of no more than $10. If you wish to play tennis during the day but not stay for dinner, that's fine. If you can't play tennis but want to come for the party, that's fine. We do need to have some idea of numbers for dinner, so please RSVP Karen on 0276604411 if you are coming. Following a series of strong results in Challenger level doubles tournaments in North America and Mexico, Ben McLachlan has reached a new high ranking, coming in at exactly 200 in the new list published on 24 October 2016. This means that Ben is ranked higher in doubles that some of the games biggest superstars, notably Jo-Wilfried Tsonga (208), everybody's favourite bad boy Nick Kyrgios (227) and even double Olympic champion Andy Murray (262). Go Ben! The combined Southern Lakes team for the Southern Quadrangular Tournament in Dunedin on 11th to 13th November is probably the strongest ever and we have a real shot at going one place better than last year and winning the event. Congratulations to those selected to the event - the teams are listed below together with team managers. Thanks for the parents for putting up their hands to manage the teams. Big thanks also to Grant Porter of Wanaka Tennis Club for co-ordinating the whole squad. In addition, many of the Southern Lakes team will also be competing in the Year 5/6 and Year 7/8 Primary School Champs tournament which is on Thursday 10th prior to the Quad. Good luck team. Ben and Aussie partner Jarryd Chaplin have finished runners-up in the Monterrey Challenger in Mexico. In a closely fought final the boys were beaten 6-7 6-4 10-2 by the American pair Denis Kudla & Evan King. Ben gets US$1,800 for his efforts this week and perhaps more importantly 65 ranking points, which has taken his ranking up to a new high of 204. Ben & Jarryd now head back to the States for the Las Vegas Tennis Open. Queenstown Tennis Club's Opening Days are fast approaching. We have three Seniors (ie. Adult) Opening Days on Saturdays 27, 24 Sept and 1 October. The Junior Opening Day for school age players 5-18 is on Sunday 25 September from 1-4pm. Everybody is welcome to come along to these Opening Days, to have a game, maybe try a new racquet out, or discuss coaching with the coaching team. membership forms for be available for registration, and you can learn about all the club's activities, including social tennis, competition play, tournaments and social activities. The official end of season prizegiving took place on Saturday 7th May at Lone Star and was well attended. Vice-President reece Gibson presented the awards for the Twilight competitions and Club Championships, as well as the new categories which were introduced this year. The National Secondary Schools' Championships were held in Auckland over the 4-7 April 2016. The Wakatipu High School team finished 5th overall out of 8 teams competing, and was the highest placed of the South Island teams at the event. In the round robin section of the competition WHS had an easy win against St Peter's, Cambridge, but then lost narrowly to Palmerston Boys High School, and was beaten by eventual winners St Kentigern College of Auckland. In the play-offs WHS comprehensively beat Christ's College, Christchurch and Hamilton Boys High School to finish 5th. The WHS team comprised Peter Hartono, Josh McDermott, Bjorn Pollock, Manawa Rakete-Shea and Thomas Hartono. Most of the guys will be able to compete at this event for at least 2 more years and will undoubtedly do even better in the future. Well done boys. 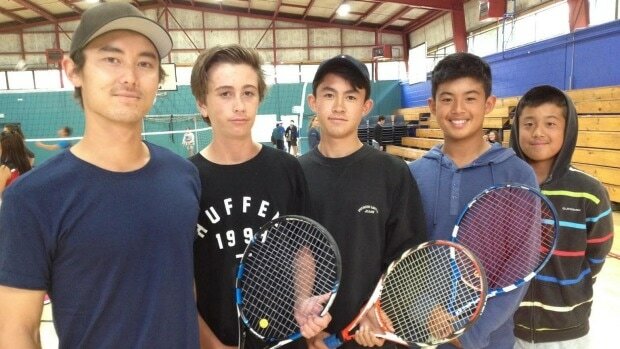 A relatively young Wakatipu High School tennis team is off to compete against the big time nationally in Auckland this week, after blitzing the field at the South Island nationals, including top seeds Christ's College. It's almost 10 years since a Wakatipu High School tennis team has qualified for the New Zealand secondary schools nationals. Ironically the team's coach, Riki McLachlan, 25, and his now international tennis pro brother Ben, 23, played for that last team. More great news about Ben McLachlan in Japan. 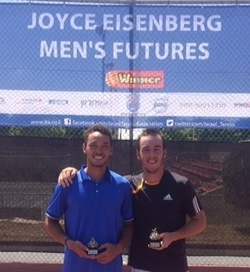 Ben & fellow Kiwi Finn Tearney have won the F4 Futures tournament in Tsukuba, Japan. Although seeded #1 the guys had to do it the hard way, coming from behind in three of their four matches. That included the final where they beat the #2 seeds Ito & Katayama of Japan, 3-6 6-4 10-4. Well done Ben. Ben stays in Japan for another week though he'll be playing with a different partner as Finn heads back to NZ to have his tonsils out! Following the final Future tournament in Japan this coming week, Ben then heads to Korea, where he is hoping to get into the main draw doubles for the Gwangju Open Challenger. Ben McLachlan has won another tournament. This time it's the men's doubles at the Ramat Gan Futures 3 in Tel Aviv, Israel, with his partner Mikelis Libietis of Latvia. Going into the tournament seeded #1, Ben & Mikelis had a fairly straightforward route to the final, winning all their matches in straight sets. However, the final itself, against Alexios Halebian & Ryan Lipman of the USA was a far more intense battle. Ben & Mikelis won 3-6 7-6 12-10. So, It's Ben and Mikelis's second title of the year together, and Ben's 9th overall in his career. Ben's ranking will rise again from what is already a career high of 340. Queenstown Tennis Club juniors have achieved outstanding results in the ILT Southand Junior Championships in Invercargill on 13-14 February 2016. Carson Tyne won the Boys 10u singles with fellow QTC junior Harry Seeto being the runner-up. Carson & Percy Meehan also won the Boys 10s doubles. Harry Seeto & Kai Milburn were the runners-up. Dan Milburn won the Boys 8u singles, and also took out the Boys 8u doubles with younger brother Noa, who has only just turned six years old. Well done to all these great QQTC juniors who have really put in the hard work this season and now have the medals to show for it. Queenstown Tennis Club members swept the board in the main events at the Lone Star Queenstown Open, played over the 13-14 Feb 2016 at QTC. A large and appreciative crowd enjoyed outstanding tennis under clear blue skies with temperatures nudging 25c both days. Number 1 seed Riki McLachlan beat Mitchell Sizemore (Dun) to take the Men's Singles, and then teamed up with James Smith to win Men's Doubles as well, beating Lane Bale & Bjorn Pollock in a match decided by a super tie-break. Also seeded #1, Emilia Price took the Women's Singles, beating Tharubphet Homkrun (Chc) in the final, and then teaming up with Felicity Oxnevad to beat Tharubphet & Ines Stephani (Wanaka) in a very tight and fiercely contested Doubles final. Congratulations to all participants who made it such a great event and big thanks as always to Dave Gardiner and Lone Star for sponsoring the event. QTC member James Penwell and Mat Begg from Clyde Tennis won gold in the Men's Doubles 35-54 at the Master Games in Dunedin over Waitangi weekend. In a round robin competition James & Mat beat all the other four teams in the age group to take the title. 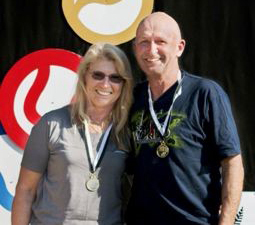 Simone Hart & James Penwell took Silver in the Mixed Doubles 35-54 in the same tournament. Simone & James won their round robin group to progress to the final but lost to ​​ Judith Wallace & Peter Murray. Win win win! The world’s best tennis players continue to battle it out on court in the Australian Open begins on 18 January. Our friends at FAN PASS have gifted us 10 free Week Passes to stream the tournaments LIVE online. Perfect for those of you who don’t have SKY and don’t want to miss any of the action. To take advantage of this FANPASS offer, just be one of the first 10 people to email the club with the message header. I WANT A FREE WEEK FANPASS. If you're one of the first 10 lucky members, we'll email you back your promo code. Note that you must be a fully paid-up 15-16 member of QTC to enter, and one per household only. Please note this is a third party offer to QTC members and QTC has no financial or other stake in the promotion. For more info on FanPass see the links below. The QTC Xmas Party will be held on Saturday 12 December. We will have a special "Fast Four" doubles tournament from 1pm onwards, everybody welcome. Then from 7pm onwards we'll have our Christmas buffet dinner - $25 per adult (members are welcome to bring partners/guests) and kids are free of charge. We'll also be having a Secret Santa. If you wish to receive a gift from Santa, please bring a wrapped gift to the value of $10. Parents who wish their kids to receive a gift should bring it wrapped and labelled with the child's name. We do need to know numbers for the dinner so RSVP to Karen Mitchell on 027 660 4411. Just turn up for the tennis whatever time suits you. The Southern Lakes Division 1 team demolished the opposition in the Team Events (Quad) held on 28-29 November 2015 at Queenstown Tennis Club. In the team's first match they had achieved an unsurmountable leadagainst North Otago 8-0 before rain stopped play. The following morning the S.L. team trounced Otago 12-0. Well done to all the team members. Full results are available HERE. The Southern Lakes Division 2 team was narrowly beaten in the corresponding event, held on Sunday 29th November in Invercargill. The S.L. team beat Southland Maroon 9-3 and tied with Southland Gold 6-6, losing by 2 games on a countback. The second leg of the event will be held in February 2016 and will no doubt be a exciting and closely fought match. Well done to all S.L. players. Full results are available HERE. 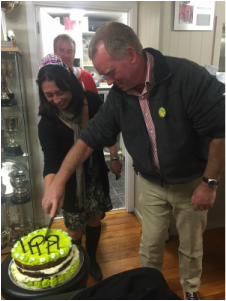 Suma (50) and Boothy (60) celebrated their joint birthday on 26th September with a party at the clubhouse following our third Open day. Both are stalwarts of the club and have been members for years, in Boothy's case more than 30 years!!! Check out the photos in our birthday gallery. Congratulations Suma & Boothy from all your friends at QTC. As we did last year for the inaugural Queenstown Marathon QTC will be providing volunteers to assist at the Queenstown Marathon on Saturday 21st November. The more volunteers we can provide, the greater the donation we receive from the organisers for our efforts so please make every effort to be available for this event. There is an official registration form for members/friends of QTC. Please make sure that you register using this form or else the organisers will not know you are QTC. You can also sign up friends/family members using the same form even if they are not QTC members. I promise that the weather will be better than last year! Ben has won yet another doubles title. Once again Ben has combined with Aussie Jarryd Chaplin for their third consecutive Futures doubles title in as many weeks. This time they won the final at Meitar, Israel, defeating the top seeds Michael Geerts (Belgium) and Italian Stefano Napolitano 7-6(5) 6-2 in the final. The win was Ben’s seventh career Futures doubles title in total and sixth in 2015 alone. Ben will now play the Futures event in Antalya, Turkey. Another week, another doubles title. that's two in two weeks in Israel for Ben (2nd left) and Aussie partner Jarryd Chaplin (left), beating an Israeli pair 7-6 6-2 in the final in Kiriyat Gat. The question now is can the guys make it 3 out of 3 as they move on to the Meitar Open, also in Israel, where they are seeded #2. 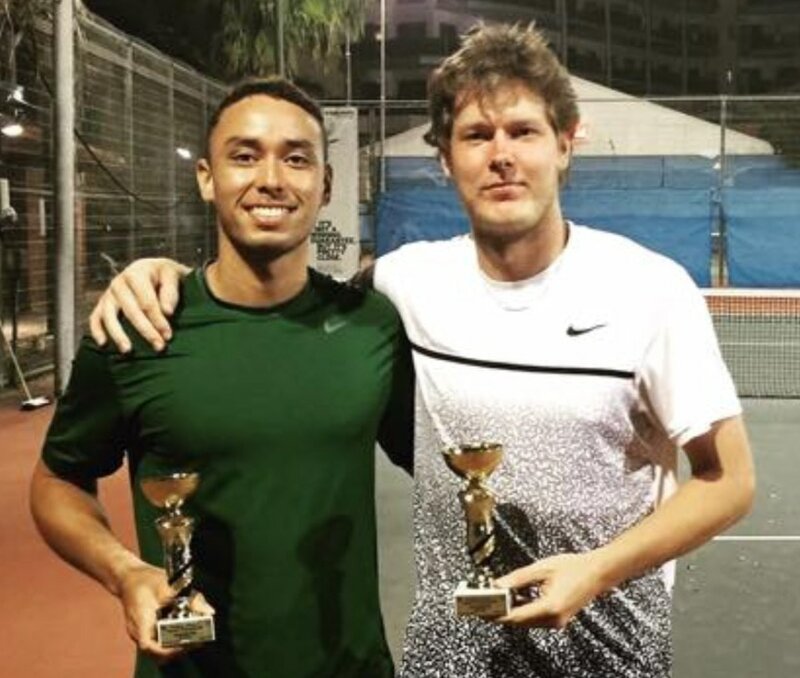 ﻿﻿Ben McLachlan now has yet another ITF doubles title to add to his already impressive accomplishments. Partnering Jarryd Chaplin (Aus) and seeded #1 the guys coasted through to the final of the F10 Futures Event in Ashkelon, Israel without losing a set. Things were tougher in the final but Ben & Jarryd prevailed over the #2 seeds Kanar & Rousset of France 6-2 4-6 10-8. Ben (left in photo) will stay in Israel for another week, competing in the F11 event at Kiriyat Gat. Felicity Oxnevad was awarded Tennis New Zealand's "Senior Player of the Year" at the recent Tennis New Zealand awards in Christchurch. This caps off a great 14-15 season for Felicity, during which she won the ladies singles, ladies doubles and mixed doubles in her age group at the Tennis NZ Seniors Championships and represented New Zealand at the Seniors Worlds in France. Congratulations Felicity. Another week, another doubles title for Ben McLachlan. Ben is really on a roll now having just taken out the men's doubles title at the Showanamori F7 tournament in Tokyo-Akishima, Japan. For this tournament Ben was partnered by Yuya Kibi of Japan and the pair were seeded 3. After a couple of straight-sets wins in rounds 1 & 2, Ben & Yuya beat the top seeds of Japan in the semi-finals with a tough 3 set win, and then followed that up in the final with a more comfortable 6-3 6-2 win over the second seeds Onozawa & Watanuki, also of Japan. Ben is currently ranked at 499 in doubles, having risen an incredible 1,275 places since this time last year. This latest victory will see his ranking rise again. Ben will now move on to Sapporo, Japan for the last week of the current Futures series there. Ben McLachlan has added another title to his growing list of tournament triumphs. 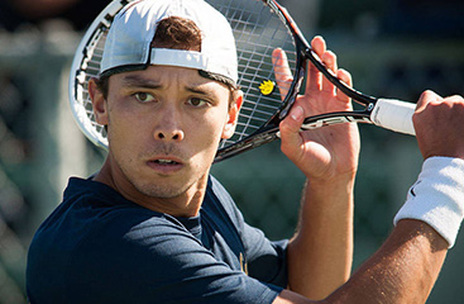 He and partner Keisuke Watanuji won the Japan F5 Futures event at Karuizawa, taking out the top seeds Katayama & Onozawa of Japan in the Final, winning 6-1 3-6 10-3. . That's Ben's 2nd doubles title in just 3 weeks. Ben now stays in Japan for the F6 tournament at Kashiwa. Well done Ben - onwards and upwards. The Southern Lakes team, comprising players from Queenstown, Wanaka and Clyde clubs, competed at the Queen's Birthday veterans tournament over the weekend at Dunedin and had a great result, being edged into second place by Canterbury by the smallest possible margin. After all rounds had been completed Southern Lakes, Canterbury and Otago were all level on 4 wins and 1 defeat. This came about because Otago beat Canterbury, Southern Lakes beat Otago and then Canterbury beat Southern Lakes. To determine the overall 1st, 2nd, 3rd placings a countback system was used which resulted in Canterbury taking it over Southern Lakes by 1.5 points. Nevertheless this is a tremendous for Southern Lakes which is by far the smallest region competing in the tournament. Huge thanks to everyone who participated in the tournament; Li Ying, Suma, Karen, Tammy, Sarah, Simone, Rachel, Sue, Diane, Lyndel, Mark, Tim, Jason, Reece, Peter-Ray, Matt, John, James and Andrew. Huge thanks as always to Karen and Mark who managed the organisation and training for the tournament. It's a big commitment from them both so massive thanks. They are now both taking well deserved holidays in Europe and Japan - have fun guys. 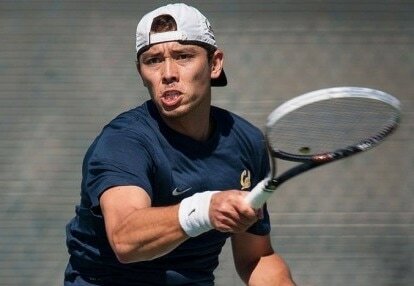 Ben McLachlan has won his second professional doubles title by taking out the USA Futures F15 title in Orange Park, Florida. Ben was partnered with Jean-Yves Aubone (USA) and seed﻿ed 3 for the tournament. The guys made it through to the final without dropping a set and then took the title by beating the 4th seeds Facundo Mena & Max﻿ Estevez (both of Argentina) 6-4 6-4. Ben is now back in California training hard with brother Riki, before heading to Guam and Japan for more tournaments. Top QTC junior Miki Nobuzawa leaves for the USA at the end of March to further increase his tennis experience. He will be living and training in New Orleans, Louisiana and competing against national ranked kids, college coaches and adults. Potentially he could be in New Orleans until the end of 2015. Miki will be residing and training with coach Abrie Du Plooy who has extensive connections with college coaches around the States and is a friend of QTC coach Lane Bale, who was instrumental in setting up this great opportunity for Miki whose eventual aim is to play well enough to go to a strong Div 1 college in August 2016. Before leaving for the USA Miki expressed his thanks to everyone at QTC for the club's support over the years. "I just wanted to say thanks so much for all the support the tennis club and members have given me in the past as I wouldn't be here still competing today if it wasn't for the tennis club whom encouraged and allowed me to compete at the level I play today." Well done Miki. You've really put in the work over the years and this is your reward for your commitment and hard work. We look forward to hearing about your progress over there. Fantastic news! 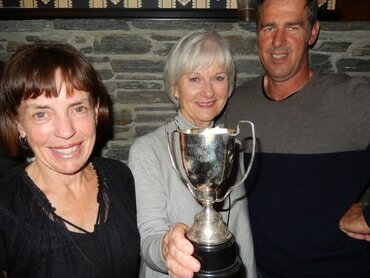 Felicity Oxnevad completed a clean sweep of the recent Tennis NZ Seniors Championships in Auckland in her age group, winning the ladies' singles, ladies' doubles (with Karen Cranston) and mixed doubles (with Peter Hampton), without dropping a set in any of those three competitions. Great work Felicity. After winning the New Zealand Seniors Mixed Doubles 55+ with regular partner Peter Hampton, Felicity Oxnevad is now ranked number 1 in the world in mixed doubles in her age category. In the Auckland event Felicity and Peter comfortably saw off all challengers, and gained enough ranking points to put Felicity top of the world. Peter (from Canterbury) also rises to number 1 in the men's listings in his age group. Felicity's world ranking in her age group also rises to 57 in singles and 26 in doubles, although she has played far fewer events than many higher ranked players, so her ranking is sure to rise further as she plays more events.